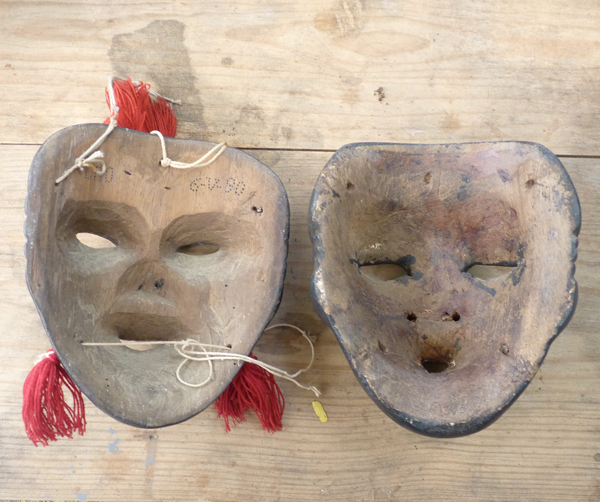 I have been visiting Lao and building up a collection of his masks over the last decade. I like them because they are carefully carved, innovative in their design, and highly attractive. An additional feature that I value is that he signs and dates many of his masks, using the point of a nail to outline the numbers and letters. 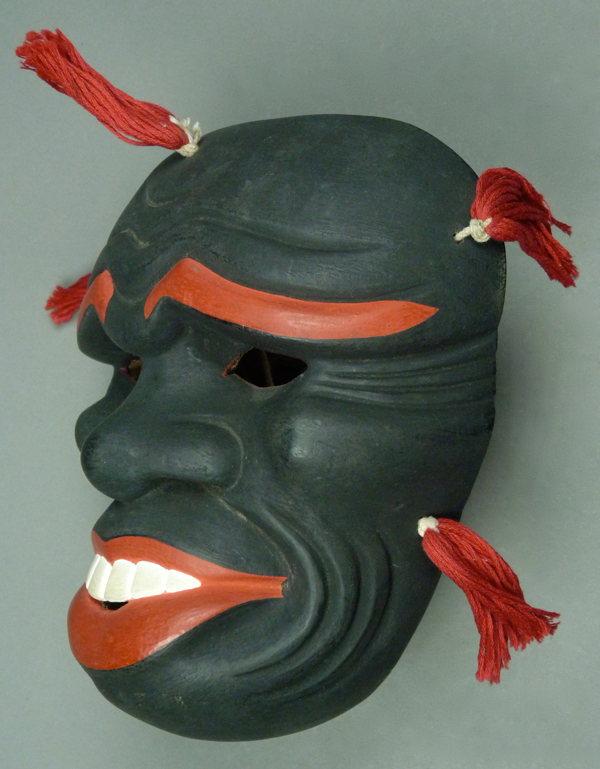 Because he loans out his masks for use by dancers, I have purchased some from him that have been used. This visit was especially interesting because I had brought along an old anonymous mask and photos of others, asking Lao if he could identify the carvers. I was pleasantly surprised to find that the mask and some of those in the photos were acknowledged as the work of Lao’s brother Filiberto. Lao confirmed others that I had found elsewhere as his work. Lao did have some prepared blanks (shaped slabs of wood destined to become masks) that I meant to photograph, but these got lost in the parade of interesting material; the partially carved masks by Filiberto in last week’s post will have to suffice as explanatory examples for this practice. In this photo we compared a mask by Lao with another that was attributed by Lao to Filiberto López Ortiz. Can you guess which was which? The answer follows the next photo. Comparing the backs of the same pair, it is obvious that Filiberto has carved his usual smoothly contoured back, while Ladislao has carved his mask’s back to an appropriate standard for use, but without Filiberto’s sculptural approach. That mask is dated May 6, 1990. 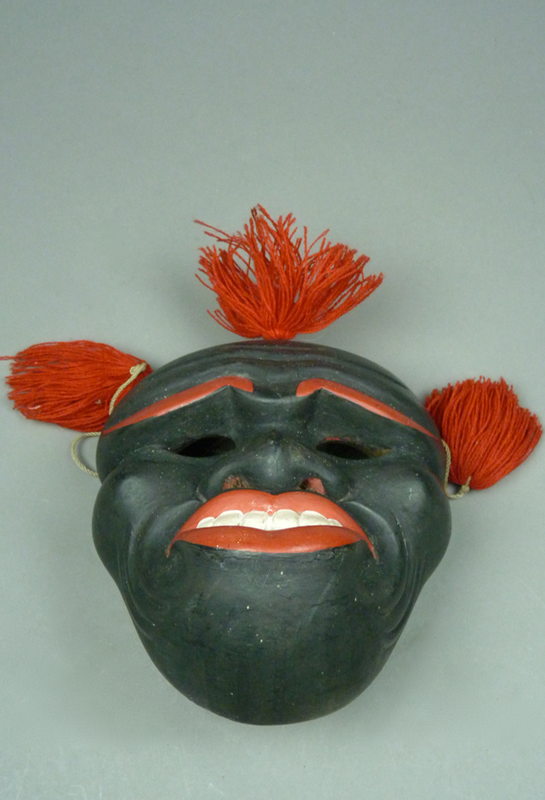 Now I will show multiple views of these masks, beginning with the one attributed to Filiberto López Ortiz. The nose is extremely broad, the teeth are tall, and the lips are thick. 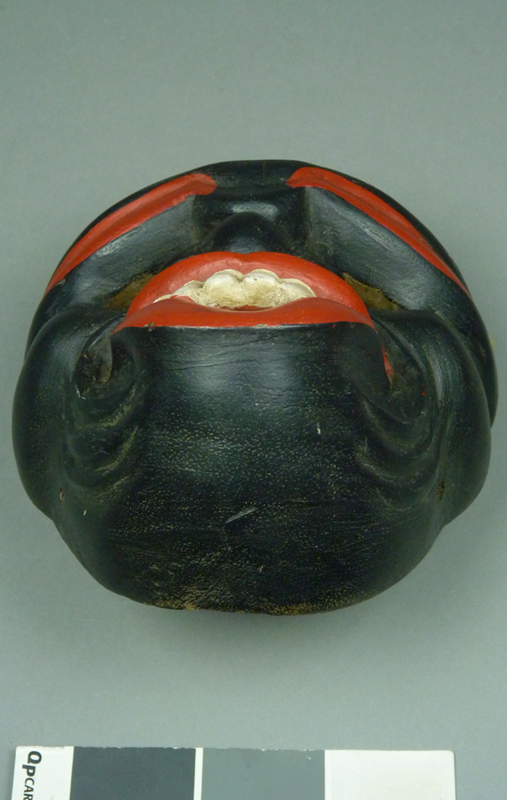 The grooves lateral to the eyes are finely carved, as are the arcs around the corners of the mouth. This mask is 7 inches tall, 6 inches wide, and 3 inches deep. I always turn a Filiberto Negrito mask this way to note the sculptural contour of the chin. 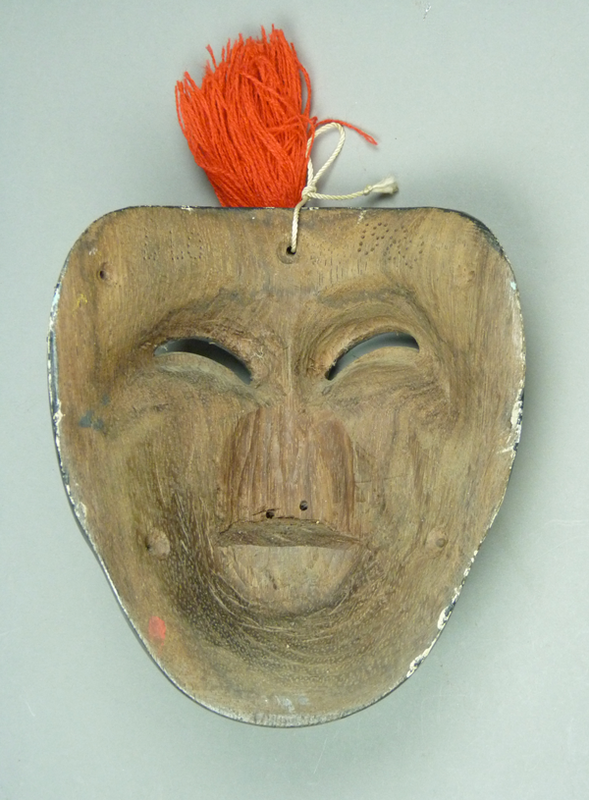 Carved in about 1960, this mask was collected in the field in about 2014. This explains why the back demonstrates such remarkable age. Note how appropriate lighting demonstrates the dark staining of the back, while the photo taken in the field was excessively illuminated by sunlight and the color of the back was washed out. On the other hand, if the next mask looks unlike the one in the comparison photos, that is because it is not the same mask. Ladislao wished to keep the photographed mask as a model for making copies, and he sold me a copy that I suppose was made more recently, although it is not dated. This mask presents a beautiful portrait of a human face. It is 7 inches tall, 6 inches wide, and 2½ inches deep. I believe that this mask has had only mild use. 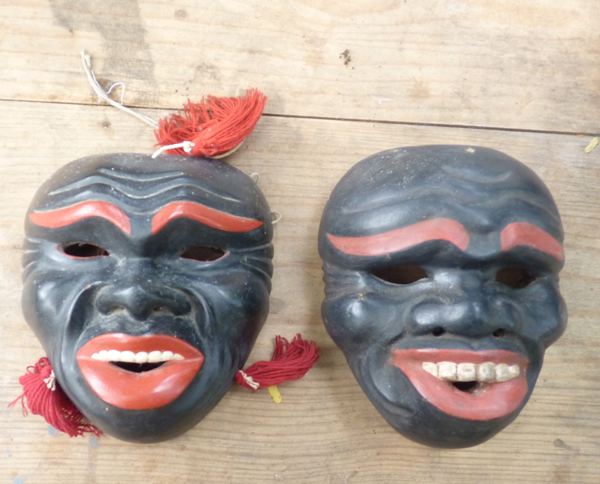 Now I will show an interesting trio of Negritos by Lao in a more typical style that I will call the “all black Negrito.” These are similar to those you have already seen in last week’s post that were carved by Filiberto. I obtained the masks on the left and right from Lao in 2004 and found the anonymous lower mask in Tucson, Arizona. 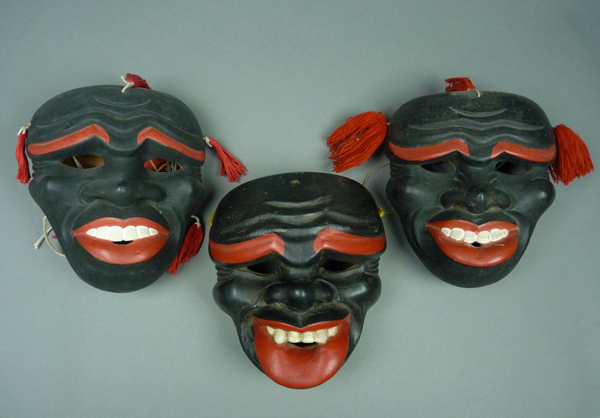 It is worth noting that each of the three masks is a little different from the next. I will start with the one on the left. 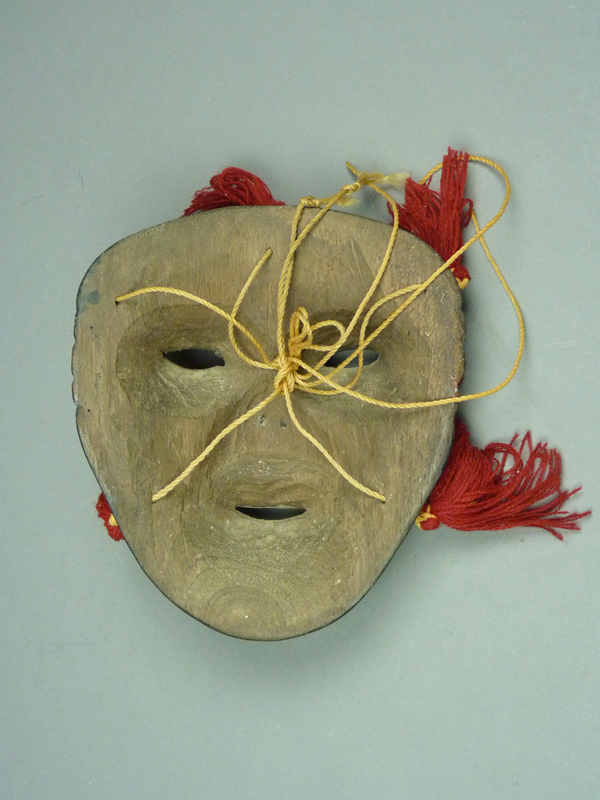 This is a copy of a mask that was made in 1910 by the grandfather of Ladislao and Filiberto. 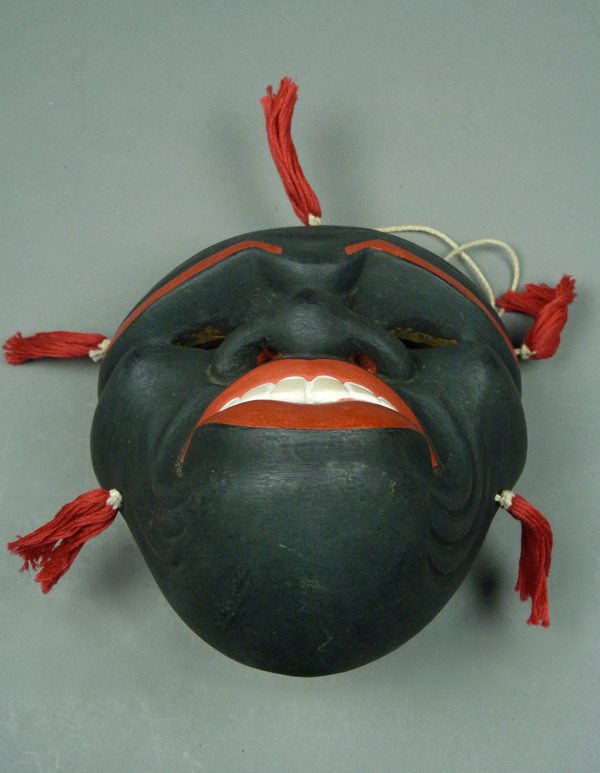 It demonstrates an invention by their grandfather at that time; he carved a channel from the interior of the mask that opened under the front teeth, to provide fresh air for the dancer. 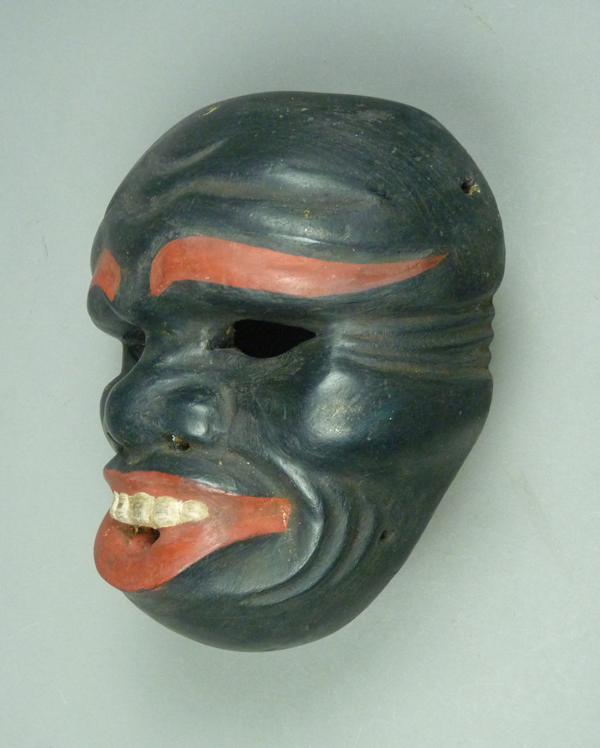 It is painted with flat black paint because that was how their grandfather painted his masks. This mask is 7 inches tall, 6 inches wide, and 3 inches deep. Note again the pleasing lines typical of the masks by Filiberto and Ladislao. On the left Lao has punched his initials- LLO. On the right he punched V 2001 (for May 2001, the date of carving), and on the next line 1910, to indicate the date of the original design. 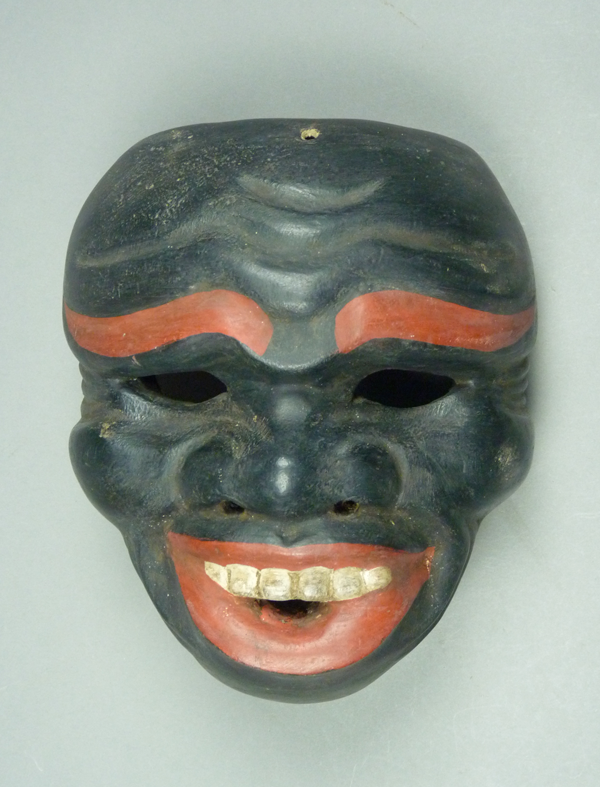 This mask seems undanced, a model that Lao made for his own reference. 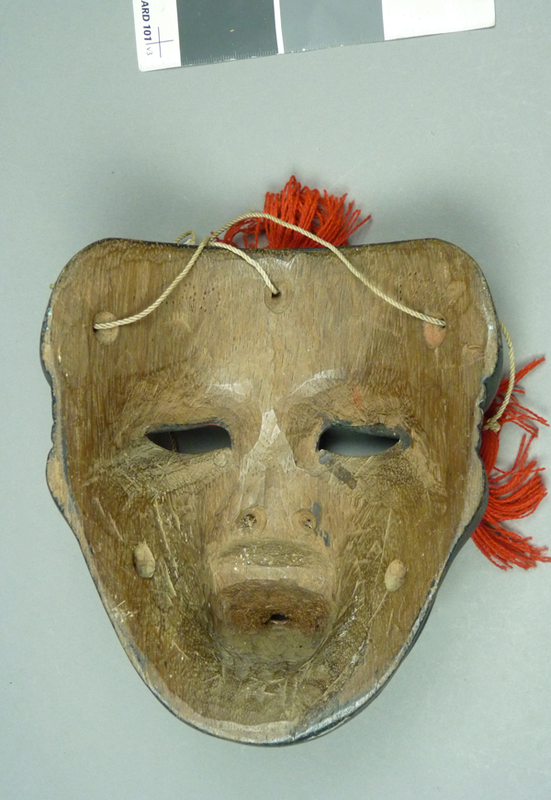 As you will also see on the masks that follow, Lao carves the breathing tube with a conical shape. The mask to the right of the last mask was painted with semigloss paint. 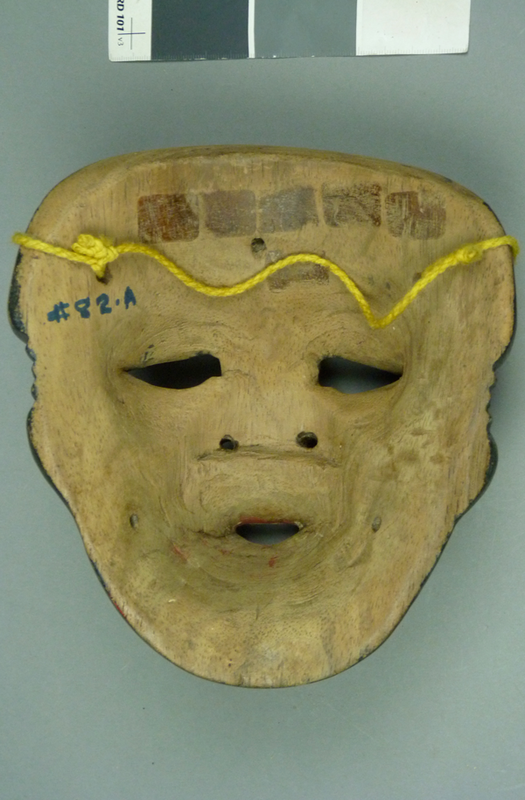 Pinholes in the surface of the paint indicate that this mask was carved from wood that was infested with wood boring insects. As a precaution I have treated the infestation with multiple trips to the freezer (two weeks in, then two weeks out, and finally another two weeks in). It is a wonderful mask and I want to prevent serious damage. This is another handsome mask. Lao carves the teeth differently from his brother; the teeth are shorter and the ones on the ends are even smaller, as if less exposed. Look at the beautiful carving of the skin folds beside the mouth and lateral to the eyes. 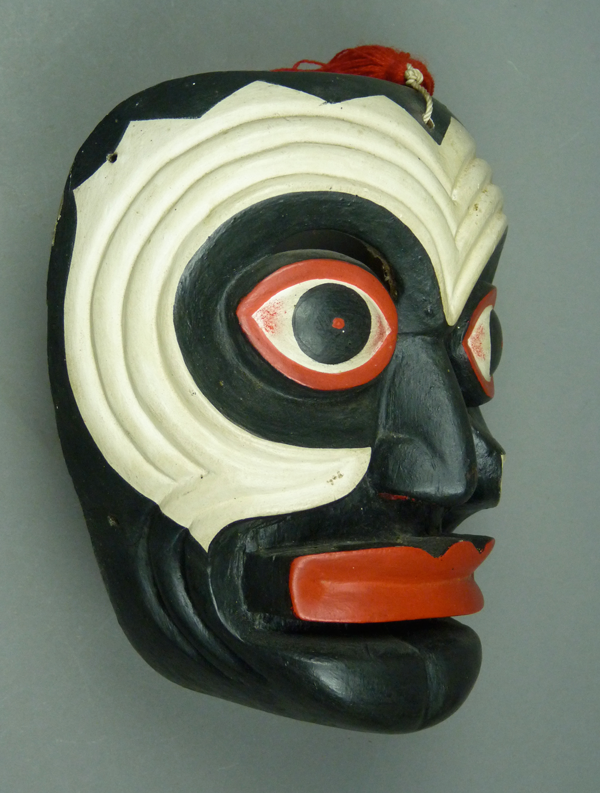 This mask is 7 inches tall, 6 inches wide, and 3 inches deep. Note the barrel-shaped form of the area over the nose. This feature is more pronounced on Ladislao’s Negritos, compared to softer lines on those of Filiberto (scroll up to earlier photo for comparison). These tassels are found on masks from the Mixtec coastal towns, but they are uncommon in other areas of Mexico. 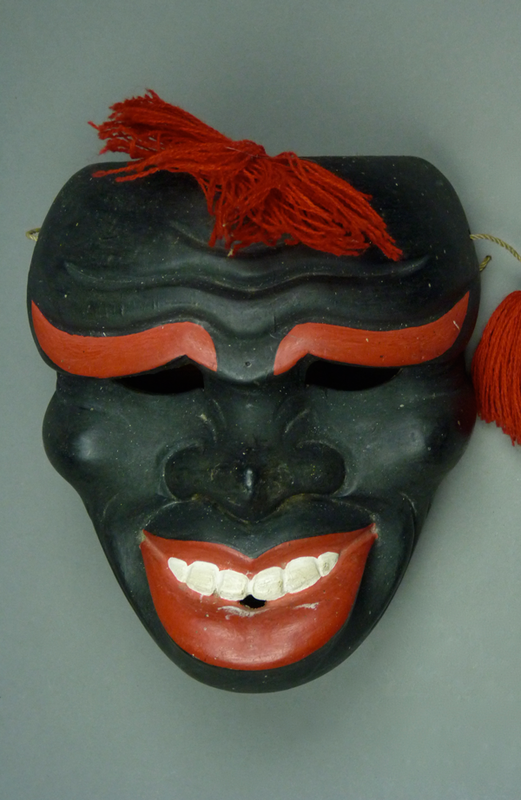 Note the recessed string holes on this mask, an inconsistent marker for Lao’s hand. The letters LAO are pricked on the left, on the right is pricked 1980. The back is notable for marked staining from use, leading to such dramatic smoothness that one could momentarily think that this was a mask by Filiberto. 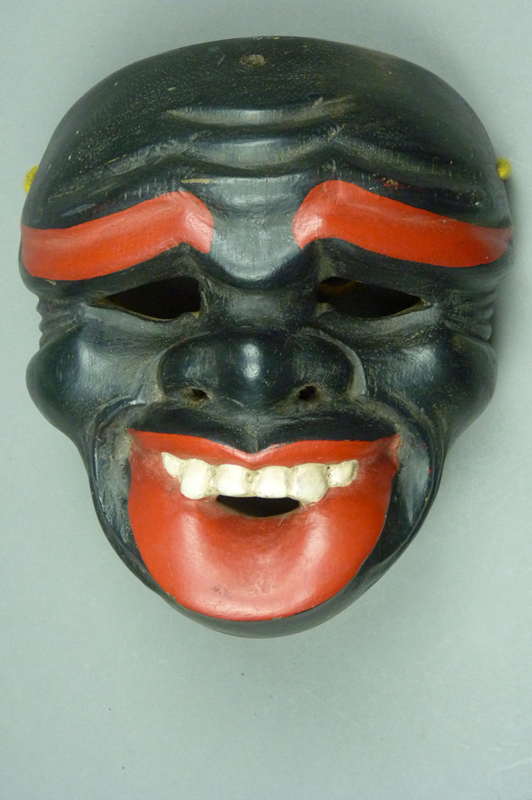 As you can see, Lao includes the conical air shift to the open mouth on each of the masks of this design. Filiberto did likewise, but he developed a smoother contour that integrated the air passage with the overall design of the back (as on the earlier mask in this post), whereas Lao tends to create a shelf between the hollow for the dancer’s nose and the air passage below. The photographer’s exposure card at the top edge of the photo demonstrates that the lighting and exposure were unlikely to have distorted the colors of the subject (this mask). Publishers like this reference because it indicates whether the photo needs to be adjusted in order to achieve truer colors. I often include the card in photos for publication and then crop it out. 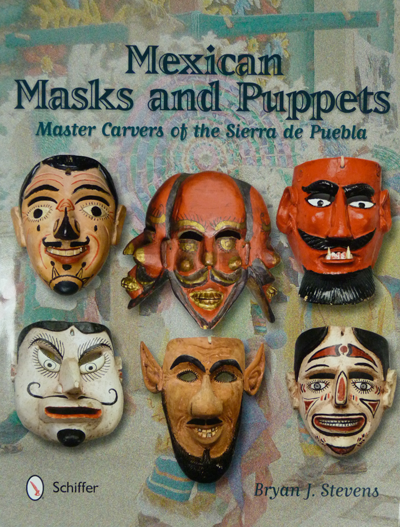 During this visit in February 2015 Ladislao confirmed what I had assumed, that he was also the carver of the mask below the other two, the one I had found in Tucson. All three masks are in the style of his grandfather. 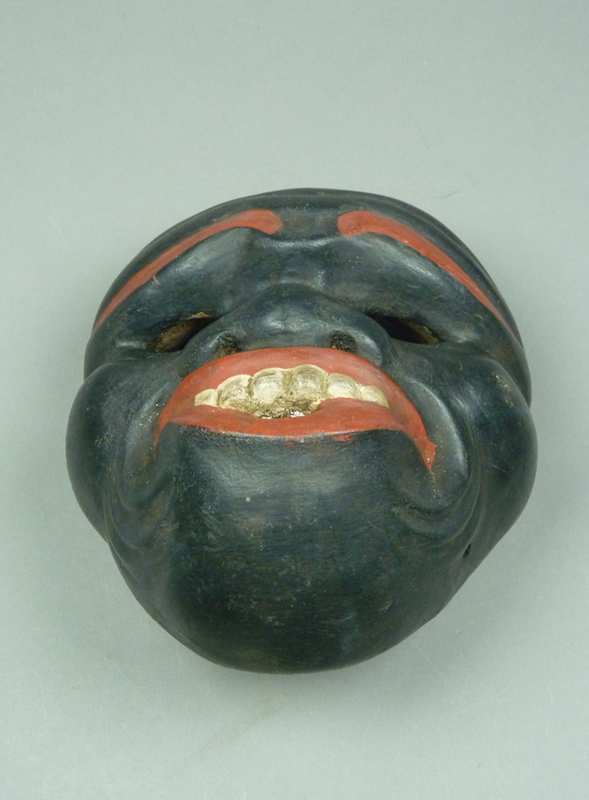 As you might have suspected from the size of the grin, the all black Negritos function as clowns; sometimes their play is a little rough. A video at the end of this post will elaborate on that point! 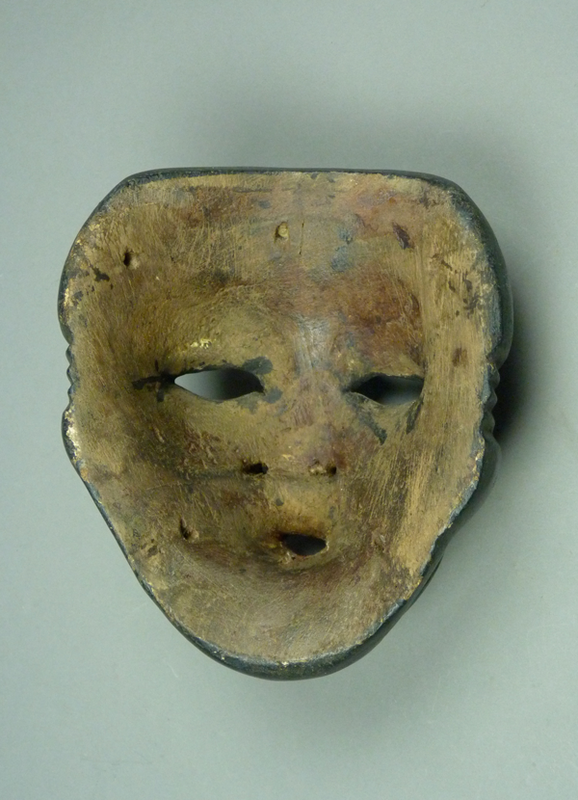 This frontal view is also a portrait of the air passages on this mask—vision openings, nostrils, and mouth. This character is jolly but rough. Is his head a miniature version of the Olmec giant stone heads? The breathing tube bridges a large gap because the lips jut out so far. 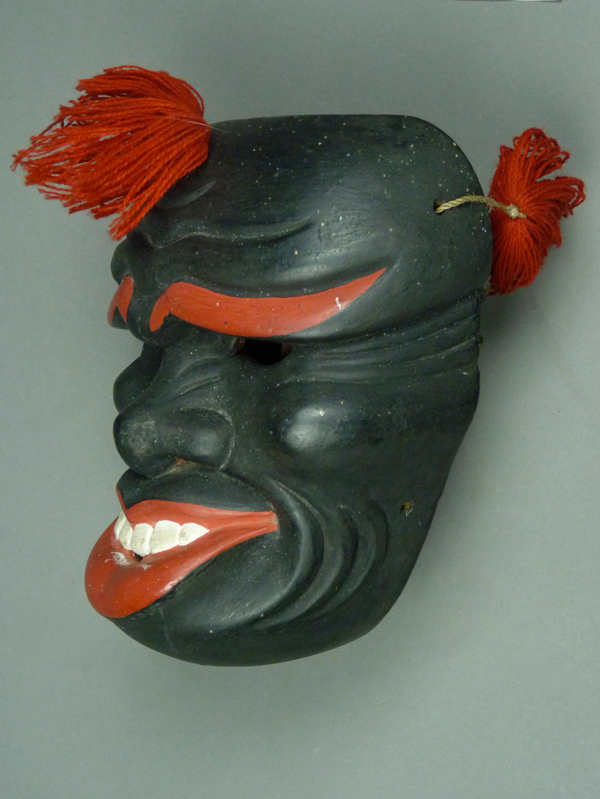 This mask is 7 inches tall, 6¼ inches wide, and 3¼ inches deep. I measure depth from the rim to the most frontal point, which in this case is the border of the lower lip. The sculptural quality of this chin comes close to that of Lao’s late brother, Filiberto. Here is another typical Lao back; this one has mild staining from use. The rectangles at the top of the back demonstrate the unfortunate effect on patina from adhesive labels used by mask dealers. In this instance the string holes are not recessed. 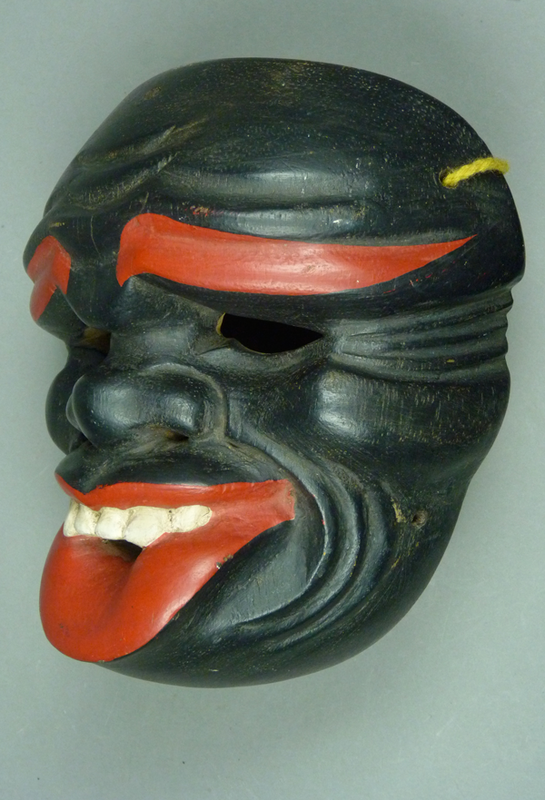 There is a second style of Negrito mask that is found in the Mixtec villages. I will call this type a Black/White Negrito, because its appearance suggests that it is simultaneously Caucasian and African. Barbara and I hope to learn the symbolic meaning of this! It is worn by a specific group of dance characters who perform with those wearing the other style. They are all called Tejorones. 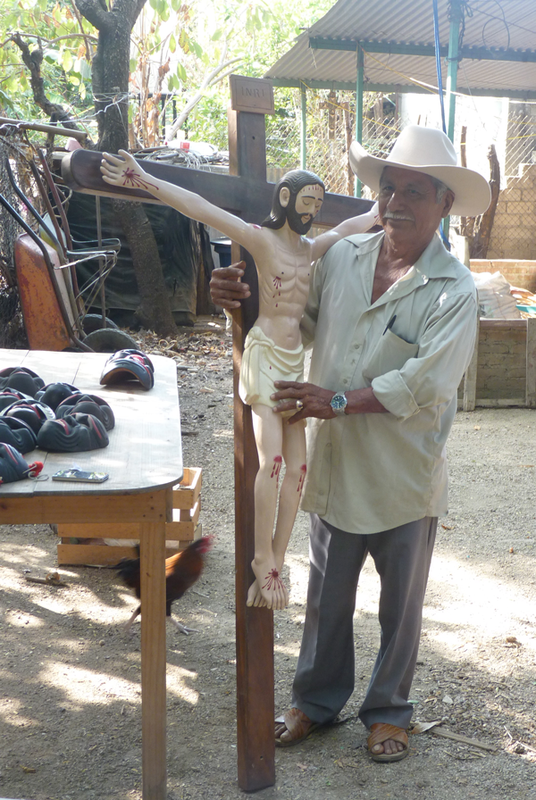 Here is a Black/White Negrito that was made by Ladislao in 1980. 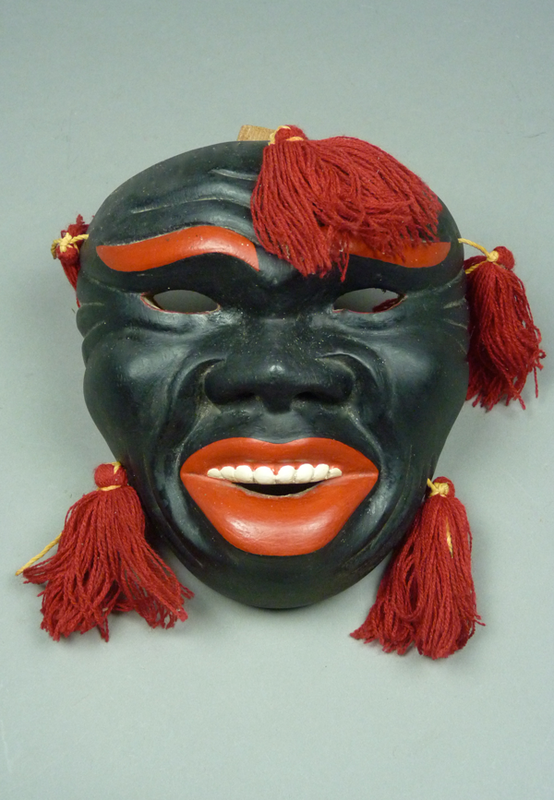 This style does not have an open mouth, so there is not an easy way to funnel air directly to the dancer’s mouth as was done with the all black Negrito masks. 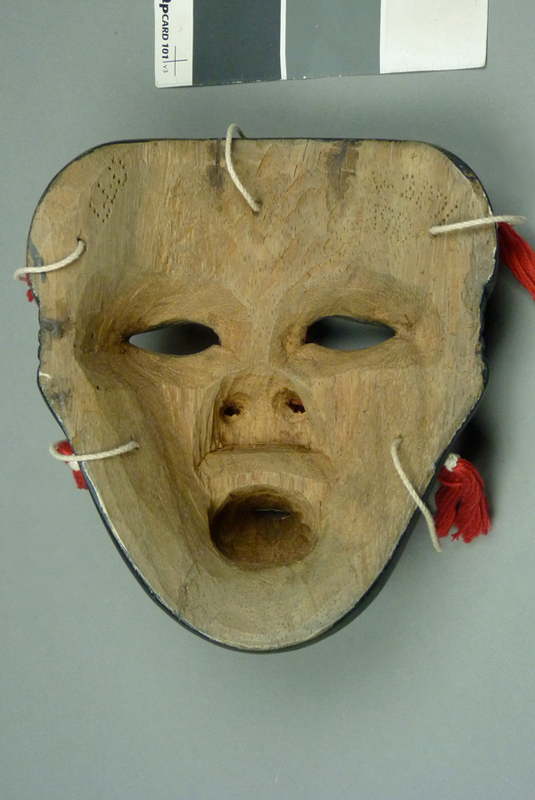 Actually many Mexican dance masks lack such a passage and the dancer’s air enters through the vision slits, through drilled nostrils, and from the back of the mask through gaps between the face and the mask. The design of this style is simultaneously striking and mysterious. Is it based on some ancient image or symbol? From the Mixtec codices, such as the Codex Nuttall, we might suppose that the ancient Mixtec priests wore the masks and costumes of deities, such as the masks of jaguars, serpents, and Ehecatl, the god of the wind. At this point I don’t know the answer to this riddle of the mask design’s origin. 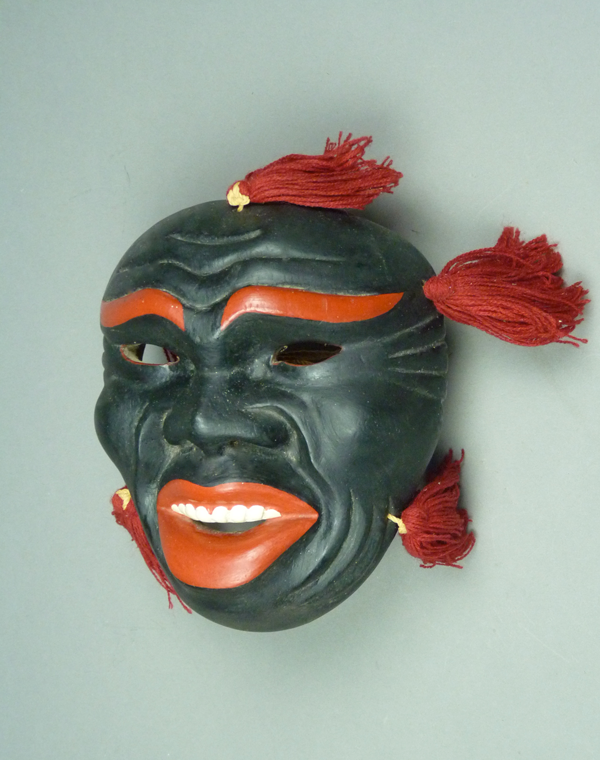 I own several of these masks that were carved by Ladislao, so I have had the opportunity study his characteristic style. This mask is typical. Several features deserve comment. The eyes extend from the recessed socket that surrounds them as if they were painted checkers pasted on to the face; this is a very stylized way to depict the eyes. The beveled sockets that surround the eyes are framed by white chevron shapes that appear to be stylized cheeks or cheek bones. According to Ladislao, the white color represents face paint. The stylized lips also extend out from the plain of the face or sub-face. 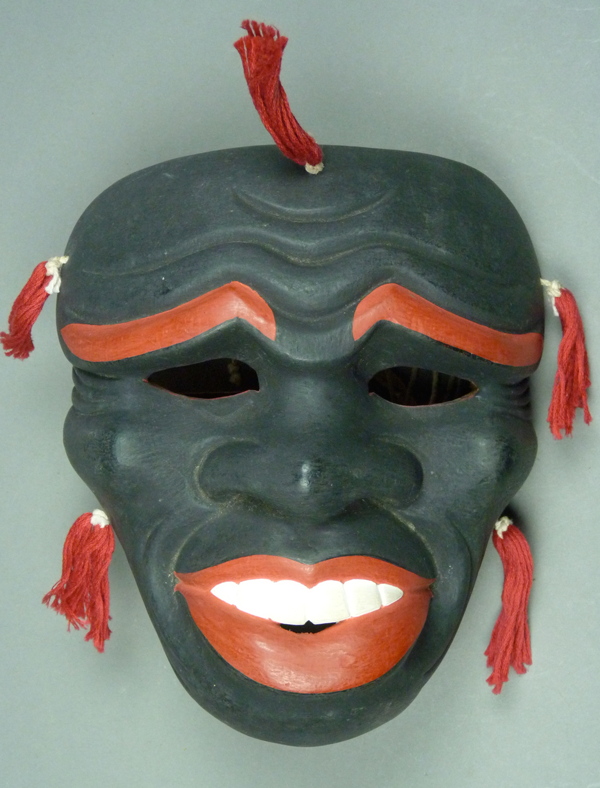 The chin of Lao’s masks ordinarily has a cleft, a line or groove that divides the chin down the middle. The vision slits are almost hidden above the curve of the eye. This mask is 7 inches tall, 6 inches wide, and 3 inches deep. 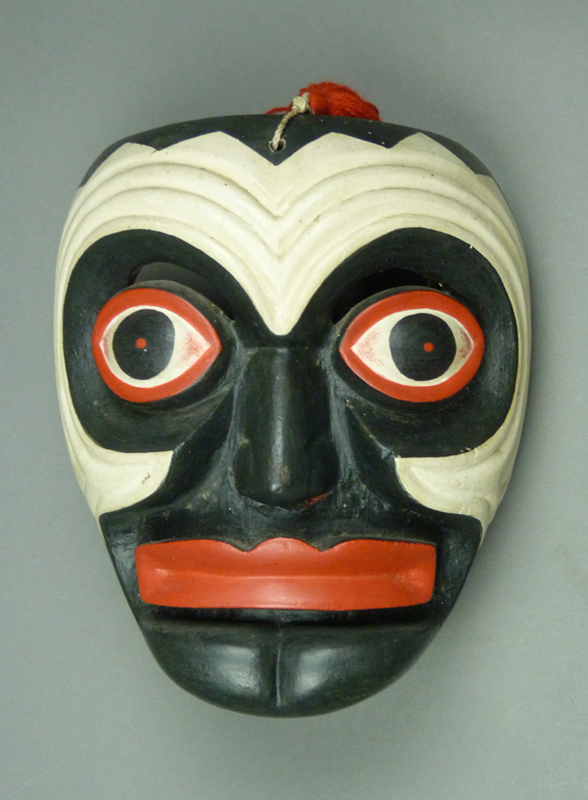 The back of this mask is also stylized in its design. There is no air passage at mouth level to disturb the shelf under the hollow for the dancer’s nose. The drilled holes for the nostrils are too small to move much air, but the large hollow for the nose probably provides a conduit for air to flow in from the vision slits. The mask is signed LLO 1980. It has moderate staining from use. To see the two styles of Negritos in action, follow the link that follows, scan the interesting text, and then open the video in the third frame down- “Carnaval in Pinotepa Nacional.” There you will recognize masks by Ladislao. The Black/White masks are most prominent at the end of the video. In the presence of tourists, the dancers wearing the Black/White masks almost invariably pose spontaneously in friendly trios, their hands on their hats. The dancers wearing all black Negrito masks never do this. In other words, although these two types dance side by side, they represent two different identities. Barbara Cleaver and I are just beginning to learn about such things. Next week I will show some mystery masks that were provided by Randell Morris, comparing them to the masks of Filiberto and Ladislao.